FlowTube can be used in any industry and is particularly suitable where customised equipment is required. With FlowTube, equipment can be created to fit in any space, maximise productivity and optimise ergonomics for employees. As FlowTube is also reusable, once a structure is no longer required, it can be disassembled and the components can be used to create new applications and solutions. Without doubt FlowTube is the perfect medium to be used in a lean environment. 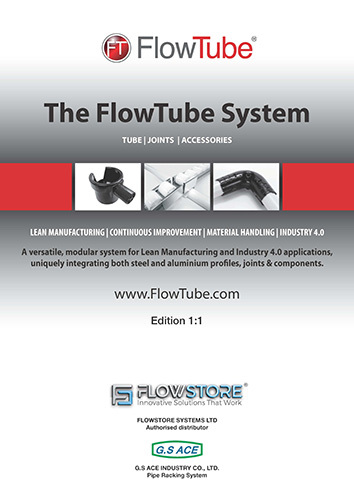 To read more about FlowTube in a lean environment, click here. Unlike off-the-shelf equipment, FlowTube can be designed and built to meet requirements exactly. Rather than having to modify the process to fit purchased equipment, FlowTube means that the equipment can be customised to fit the process. As it is can be quickly and easily modified FlowTube can also adapt if the process changes. FlowTube can be used to create or improve every aspect of an assembly line - from integrating into conveyors systems to setting up line-side storage, and even building custom inventory replenishment trolleys. FlowTube is ideal for setting up, for example, custom electronics manufacturing cells including specialist workstations. FlowTube components can also be specified in electro-static discharge [ESD] compatible coatings where required. FlowTube can be integrated into other Flowstore products in warehouse and distribution facilities. 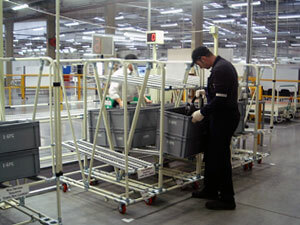 It can also be used to build items such as flow racks, picking trolleys, sorting and packing stations. Most medical products have a shelf life and FlowTube can be used to create first in first out [FIFO] racks to ensure stock is used in the correct order. 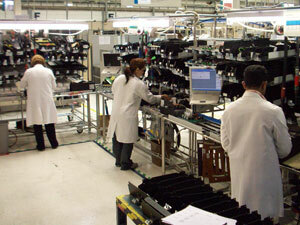 FlowTube can also be integrated with automated order picking systems to manage large numbers of SKUs. FlowTube is incredibly versatile and can be used to create bespoke equipment in a general manufacturing context. This equipment can include: trolleys, carts, transportation systems and production lines. Unlike fabricated equipment, FlowTube can be designed and built very rapidly. For relatively simple structures, the design can be a simple sketch used to determine the quantities of parts required. The parts can then be ordered, delivered and built by you with ease, or alternatively we can build it for you. Furthermore if the planned design is not perfect once it is built, the FlowTube structure can be cheaply and easily modified to remedy any problems.